When looking for power augmentation, turbine inlet air cooling is quickly becoming the best considered solution. TIAC allows energy output increase with no need to invest in new or more powerful gas turbines. Industrial TIAC solutions, such as the ones designed and manufactured by ARANER, are usually tailor-made to fit into the existing technology. However, some adaptations are occasionally needed. The modification of the filter-house is normally one of them. The performance of an inlet air system depreciates with time. It may need some form of modification or refurbishment at some point. ARANER will be at hand to help you with such a project by offering the best solutions in line with your needs. Have you noticed a decline in power plant efficiency? If you have not tried filter-house modification, perhaps this is something you need to consider. Analysis: a filtration professional starts by analyzing the current requirements to see the level of modification required. 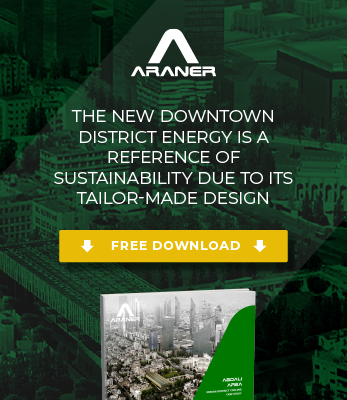 ARANER’s approach is that of consultation involving detailed data collection and consideration of turbine owner’s objectives. This way, it is easy to reach the desirable lifetime, cost, efficiency and burst performance of the filter-house. Choosing the Filtration System: for the filter-house to satisfy requirements, the correct filtration system must be chosen. Today, there are numerous types of filtration systems including the self-cleaning and rotating oil-bath types. The filtration expert will help you to choose. Construction: for the chosen filtration method to be effective, it is important to have the installation done professionally. Experts know how to place every filter-house component optimally so that contaminants do not find their way into the system. If you are planning to draw on a turbine inlet air cooling system, you will need to be ready to make some modifications on the filter-house of your power generation technology. Usually, the filter-house will admit a certain air volume which will match the volume the very one the gas turbine can also take. The air density after cooling (downstream the filters) is much higher. Bso because of the mass conservation principle, the air volume flow passing the air filters is increased. If we want to avoid an increase in the pressure drop or any disturbance in the flow, filter-house modification might be required. A Computation Fluid Dynamics is always advisable to check the airflow performance. When working on these modifications, and to guarantee reliability, ARANER uses Computational Fluid Dynamics (CFD) analysis. This system allows an efficient simulation of air flow through the entire turbine system, including both the filter-house and the TIAC technology. This flow analysis, previous to implementation, measures how air density changes through the cooling process, making sure that the volume going in the modified filter-house is equivalent to the one the turbine will be able to take after cooling, achieving therefore great performance. Along with CFD, at ARANER we have developed our own tool to simulate the performance of the TIAC plant, which contemplates factors such as real weather conditions and gas turbine parameters. The impact of filter-house modification on plant performance can be positive and immediate. Although the redesign may appear too complicated, payback will usually justify your choice. Most of the filter-house modifications change pressure drop and a host of other turbine performance factors to the better. If the environmental conditions have changed since the first installation of your equipment, filter-house modification gives you an opportunity to decide the best filtration method. Contact ARANER for effective solutions for filter-house modification. With the Extended Surface Heat Exchanger (ESHX) design, the solutions will have minimum impact on the existing design. Specifically, the custom-made design introduces water flow optimization, flawless airflow and minimal pressure drop. Specific devices used in ARANER’s filtration solutions are ARATrap and ARADrop. ARATrap comprises of a hydraulic seal that traps the condensate water and helps maintain the pressure difference between filter-house interior and the ambient. This device works hand in hand with ARADrop, whose role is to remove any remaining water drops from the inlet air. TIAC systems are used in many geographic areas, some of which demand modification of the filter-house. Since each turbine power plant presents unique design requirements, the intensity and style of modification can vary greatly. A thorough analysis of the ambient conditions followed by detailed construction is what every power plant owner or manager needs. With specialists from ARANER, you can always expect a filter-house design that is ideal for your situation.